As some of you observant readers may have noticed, I don’t often share my writing with other publications on this wondrously decadent blog of ours out of fear of becoming as queer theorist and former Chair of Performance Studies at New York University José Esteban Muñoz would call, using the biting words of Jack Smith, “a walking career.” Now, Mary, I know enough of those in the art world to know I don’t want to be that! However in the memory of Muñoz, who passed away suddenly last December, I wanted to direct your filthy attention to my recently published essay “Vacating the Here and Now for a Then and There: Remembering José Esteban Muñoz” in the Los Angeles Review of Books. 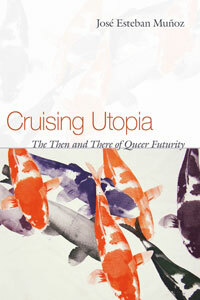 In the essay, I take a close look at Muñoz’s essential works from Disidentifications: Queers of Color and the Performance of Politics to Cruising Utopia: The There and Then of Queer Futurity to his brave support of the trangressive, transformative and subversive artists he analyzed from Vaginal Davis to Carmelita Tropicana to Nao Bustamante and Jibz Cameron. Whether creating a language to speak about queers of color or highlighting forms of survival for queers, Muñoz articulated his vision in a manner that extended beyond the university walls, which, let’s be honest, few academics ever achieve. Considering I wrote this essay with the Filthy Dreams readers in mind, as I attempted to articulate some sort of communal mourning for Muñoz and the communities he left behind, grab yourself a drink, pour some out for Muñoz and read my memorial for Muñoz here. And of course, it’s not all hopeful fun and games here. That’s why the playlist just had to end with The Velvet Underground’s harrowing 17-minute song “Sister Ray.” Why sailors, drugs, depravity and darkness can be utopian too! Tags: Cruising Utopia, Disidentifications, Filthy Dreams playlist, Jose Estaban Munoz, Jose Munoz, Queer Utopia. Bookmark the permalink.